I’d like to remind you that the first step was taken on the 20-th of June in Washington with the opening of the embassy of Cuba there. The process itself of a serious dialog between the two countries, hostile for more than half a century, started on the 14 of December 2014 initiated by the Presidents, Raul Castro and Barak Obama. This dialog coupled with a number of mutual concessions resulted in the exchange of full-fledged embassies in Washington and Havana. This is the beginning of a new stage of the relations between Cuba and the USA. It was no doubt a historical event between the two countries-antipodes spoken and written about practically in all countries, but first of all in the USA and Cuba. It was the first time during the 70 years of mutual relations of the two countries when the US Secretary of State has visited Havana. And it was John Kerry who chanced to be this highly-ranked official from the US administration. Now, after the exchange of the embassies it would be rightful to speak about a complete restoration of the diplomatic relations between Havana and Washington. However it would be premature to discuss normalization or approaching of the two countries and it is accepted by both the parties. In his speech at the ceremony of opening of the USA embassy in Havana the Secretary of State, John Kerry, said in particular that the trade, economic and financial blockade of Cuba could be raised only with a decision of the USA Congress. The embargo remains effective, said John Kerry, but the administration of Barak Obama earnestly stands for the lifting of the embargo, confirmed the Secretary of State. We aren’t enemies, but neighbors, he remarked. With the relation between our governments restored we’ll have more possibilities for the cooperation. We are neighbors and neighbors always have something to discuss, - for example, the situation with the commercial aviation, with the migration, the questions of the cooperation in the fighting with natural calamities, the problems of the ecology protection, the climate ones, said John Kerri making the speech on the occasion of hoisting of the flag. Besides, speaking of the demand of Cuba to return a part of the province Guantanamo used by the USA for more than 100 years as a naval base, John Kerry admitted the possibility to change its status, but declared that ‘this subject now isn’t under discussion”. The Minister for Foreign Affairs of Cuba, Bruno Rodriguez, met the US Secretary of State at the Ministry and held negotiations with him. According to the Cuban media, the parties admitted that it was common knowledge in the capitals of both countries that Cuba and the USA had started a very long and not at all easy process of discussion of the problems accumulated during a half of a century. But it’s most important that the parties know that this dialog will go on with a mutual respect of the sovereignty and with non-interference into the internal affairs of each other which makes a part of the notion of neighborly relationship. Both Havana and Washington admit the existence of deep differences concerning a majority of the issues, but however they demonstrate their will for a patient joint work on all the topics of mutual interest. During the negotiations and at the press-conference in the hotel "Nacional” Bruno Rodriguez confirmed the intention of Cuba to discuss any topics basing on mutual respect. By his turn John Kerry declared the position of Barak Obama administration "to look forward” and "approach Cuba as it should be done by two neighboring peoples, but not by enemies or rivals”. The both heads of foreign departments announced that the bilateral commission in charge of determination of new topics to discuss was going to implement its activity with its working groups starting to act in September and promising to have a serious and positive dialog. Bruno Rodriguez openly let the American know that the relations between his country and the USA couldn’t and wouldn’t become normal while Washington goes on with the trade, economic and financial blockade of the Island, while the Cuban territory in Guantanamo remains used as the US naval base. John Kerry agreed that there were many problems which would be discussed during the dialog. The solution of some problem will be easy and of the others – more complicated, but any of them will remain unnoticed by the parties, confirmed the Secretary of State of the USA. During the negotiations Bruno Rodriguez e John Kerry also touched such topic isn’t at all easy as compensation for the damages caused to their countries. It’s common knowledge that Cuba has claimed the indemnity of the losses resulting from the aggressive policy Washington pursued for several decades. 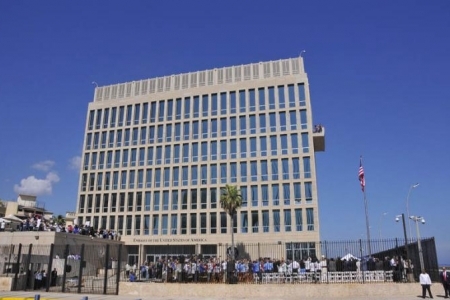 The USA demands reimbursement of the damage caused to their citizens by the nationalization of their propriety during the first years after the victory of the revolution in Cuba. In short, the events and conversations in Havana have been promising and hallmarked with mutual respect. And the partners have demonstrated their intention to build mutual confidence actively and to look the ways bringing their positions together. Meanwhile the US tourism to Cuba has begun to increase. Since the beginning of 2015 it grew 54% compared to the same period of the last year. Some 89 thousand of the USA citizens visited the Island during the last six months. It is the Cuban statistics with the exception of 164 368 the US dwellers of Cuban origin that came to visit the republic. The development of the immigration tourism is very important for Cuba because it results in more than 2,5 billions dollars brought to the state treasure every year. Besides the sector of hospitality provides jobs for some tens of thousands Cubans. The revenues of the country grow alongside with the growth of the foreign tourism. Whilst last year there were a little more than 3 millions of foreign tourists who visited the Island, it’s expected, that 3,5 millions of them, including by the way 145 millions of the USA citizens, coming in 2015. According to the assessment by the experts, the touristic capacity of the republic of Antilles is enormous, and the embassy of the north neighbor that just has been open actually makes for its use by guests from the USA. Though a free visiting Cuba by the US citizens is still prohibited by the law once adopted by the Congress. However Barak Obama with his President’s decision has given the green light to his fellow citizens visiting Cuba with educational, scientific, cultural and sports purposes. American businessmen, from owners touristic and transport companies to manufacturers of various agricultural and industrial products, also have ambitious projects related to Cuba. For instance, the Association of the automobile sector enterprises, "Automation Alley” has announced recently a commercial business-mission going to Havana in October 2016. The Association already organizes forum for specialists from the SME who want to study the Cuban market which they don’t know so far. Many others American companies show interest in interaction with enterprises and organizations on the Island. However it’s not so easy as it may look. There are still too much obstacles for a normal cooperation and they are too big. "…The USA should compensate the damage of millions of dollars caused to Cuba which was spoken about by our country more than once in the U.N.O. alongside with irrefutable evidence and data. At it has been evidently declared by the Communist Party and by the Government of Cuba, in token of the good will, in the name of universal peace in this hemisphere, in the name of the peoples forming the only and united human family, wishing to make a contribution in order to secure the survival of our race in this small space of the universe reserved for the mankind, we will never cease the fight for peace and prosperity of humans regardless of the color of their skin and the country of origin of every inhabitant of the planet, as well the fight for a total right of all humans to be or not to be believers. This is the "wish” sent by the Comandante to the participants of the peacemaking process between Cuba and the USA. The restoration of the diplomatic relations between Cuba and the USA is a positive event. But with the persistence of Cubans defending their rightness and the stubbornness of Americans you may imagine, how long and difficult will be the dialog between Havana and Washington. Can it really be true that we’ll have to wait its positive results for another fifty years!? 608: 30 seconds to mars. The USA flag raised in Havana27 August 2015: The USA flag raised in Havana! лучшие комедии. The USA flag raised in Havana.